Can anyone tell me who this actress is? Her last appearance in a film was in this 1952 Prabhat production, which was made in both Marathi and Hindi—Prithviraj Kapoor starred in the Hindi version. Hint: Even though her last stint as an actress was in 1952, she is still a household name. Bonus points if you know the name of the film! This may be the shortest trivia post ever! Vinay and Bollyviewer both got the name right—she is Lata Mangeshkar, and Vinay knew that the film is Chhatrapati Shivaji! Wah wah! to both of you, I thought this was a difficult one! Well done. Image is courtesy of “Bollywood Nostalgia” published by Roli Books as part of the Pocket Art Series. Posted on November 21, 2008 at 3:47 pm in Hindi movies, Trivia time	| RSS feed You can skip to the end and leave a reply. Ah! nice pic. Hers is arguably the most famous household name. Starts with L. The movie was Chatrapati Shivaji. Do you know that she has also composed music for Marathi films? Ok, here’s a sub-quiz :), for everyone. What was the pseudonym she used as a composer? I did know that she had started out singing and acting (those were the days of actress-singers) and I had also seen pics of her younger self. So it wasnt hard! I did not know about her music-composer stint, though. Thanks Vinay and Sy for that interesting trivia. And again I say: I have such knowledgeable readers, and I learn something new from you guys just about every day :-) Sweet. Hey Memsaab, you wrote “her last stint as an actress was in 1952” but does Pukar (2000) count? She made a guest appearance as herself, singing a patriotic song — and as for “acting”, she was made to make a face that was meant to convey “oh wow, anil kapoor & madhuri has saved the day!”, but i was too busy laughing out loud at her “i feel so silly being her” expression! yeah, if she’s playing herself it doesn’t count in my opinion :-) I’d forgotten about that! Ohh I love that image of her, I have that picture in the Bollywood Nostalgia postcard book by Roli Books which are all on my wall, you should buy it! Lata looks so young and lovely! Since we’re all chipping in with fun Lata facts – did you know we have Dilip Kumar to thank for her diction? Back when she was starting out, they were both on the same local train and someone introduced her to him, saying here’s our new singing sensation. And Dilip looked at this little kid and decided to tease her by saying: “Oh, so she’s Marathi? Then her accent must be completely dal chawal” and this pricked her pride enough that she concentrated extra hard on enunciating properly. Dal chawal – rice and dal. Basically he was implying her Marathi accent would sour the Hindi/Urdu lyrics. Esp coz this was the 40/50s and serious poets were composing Hindi film lyrics. Amrita: ahhh, yum. I still can’t tell the difference between Hindi and Urdu but someday I hope to. Amit: Excellent! I prefer dal makhani above all other kinds :-) and I’m still waiting for your Slumdog Millionaire post! Dilip Saab had taunted that since Lata is a Maharashtrian her accent will have a smell of dal n rice in it. But Lata proved him wrong. There is a book titled ,” Phule Vechita (While picking the flowers)” written by Lata herself. In that, she has described about her experience as Music DIrector in some Marathi films and origin of her pen name ‘Anand Ghan’. Interesting discussion here, enjoying the background on Dilip-Lata. I know from some of my closest friends who are Maharashtrian (as I am) that they appreciate how Dilip was able to assimilate into the culture — I’ve heard he speaks very fluent Marathi and seems to be well appreciated by the people of the state. 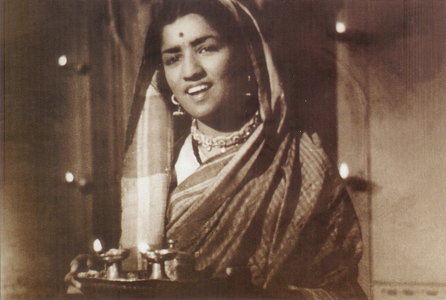 She is the legendary lata mangeshkar…. She was an actress in this film!